Thanks to Dr. Nanda Patil, Dr. Saket Kumar and Dr. Sharda Sarda, Krishna Institute of Medical Sciences (India), for contributing this case. To contribute a Case of the Week, follow the guidelines on our Case of the Week page. 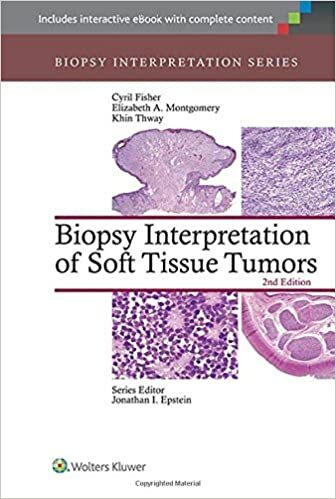 Biopsy Interpretation of Soft Tissue Tumors by Cyril Fisher, Elizabeth Montgomery and Khin Thway, 2015, 544 pages, $162 list. 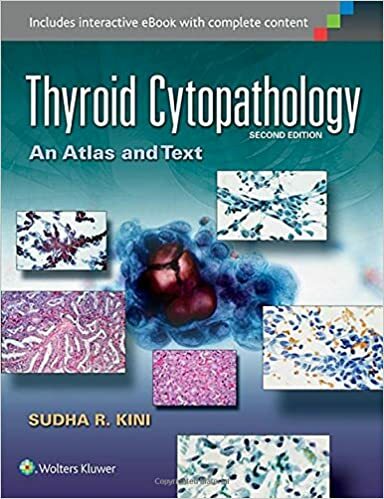 Thyroid Cytopathology: An Atlas and Text by Sudha R. Kini M.D., 2015, 544 pages, $320 list. (1) Participate in our Amazon contest by purchasing any item from Amazon.com during October 1 to November 30, 2015. Click here to find out how you can qualify to win Amazon.com gift cards for $100, $50 and $25! (2) If you are a pathologist attending the CAP '15 conference in Nashville, TN, please stop by our booth #234. Dr. Pernick will be having short discussions to get feedback on website topics. After you participate, you will receive a special, limited edition, PathologyOutlines.com baseball cap! Read more..
(3) We have made some changes to the Header and Footer, click here. (4) We are planning to remove books from 2010 or before from our Books pages, since most pathologists are not interested in buying 5 year old books. However, we will continue to post the books on the Publisher pages (i.e. ARP Press, ASCP, CAP, LWW, WHO), as well as others that appear to us to be "classics", or if there are few other books in that subspecialty. If there are other books from 2010 or before that you want us to keep on the website, please send an email to Dr. Pernick at NatPernick@gmail.com. (5) Does anyone have a set of policies and procedures for blood bank, chemistry, coagulation, hematology, immunology, microbiology or histopathology that they agree to post on our site, to help others who are starting / improving their labs? Of course, we would acknowledge you as the source (unless you want to be anonymous). Contact Dr. Pernick at NatPernick@gmail.com with any questions. (6) Last week, we posted a new Management article by Mick Raich, President, Vachette Pathology, An Overview of the New Proposed Medicare Fee Schedule, and today we posted Good Old Rocky Top: Keeping its Physicians Independent. Click here to see more Management related articles. 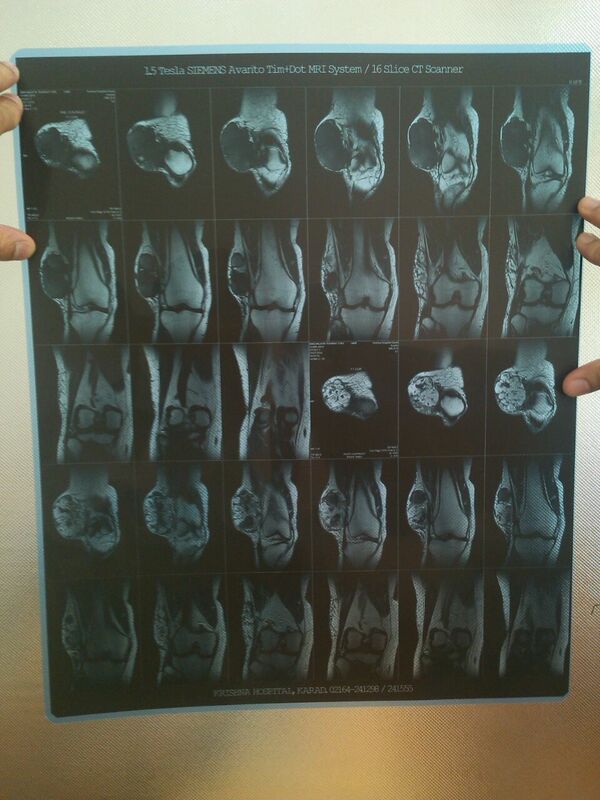 A 63 year old woman presented with a six year history of gradually increasing swelling of the lateral aspect of the right knee, now 10 x 10 cm. There was no pain, discharge or history of trauma. MRI revealed a well defined, lobulated lesion in the anterolateral aspect of the subcutaneous plane of the distal right thigh with areas of haemorrhage and necrosis, suggestive of sarcoma. No evidence of metastatic disease was identified with chest Xray and other investigations. The lesion and overlying skin were excised. 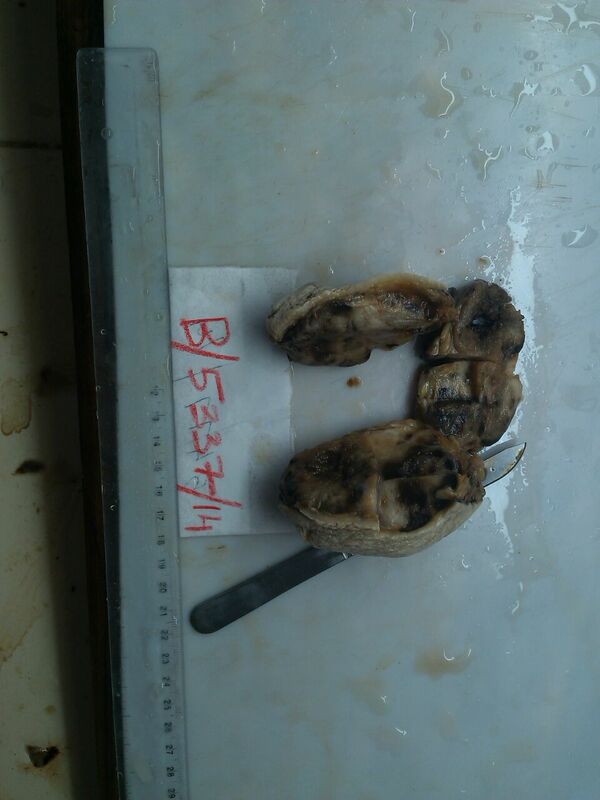 Gross examination revealed a single lobulated grey-brown soft tissue mass, 9 x 7 x 2 cm, covered with skin. 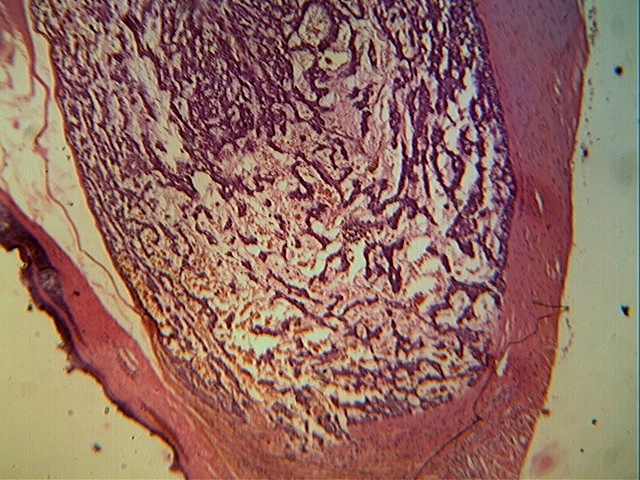 Cut surface showed multiple gray-white to brown tumor nodules with intervening areas of cystic change, hemorrhage and gelatinous tissue. 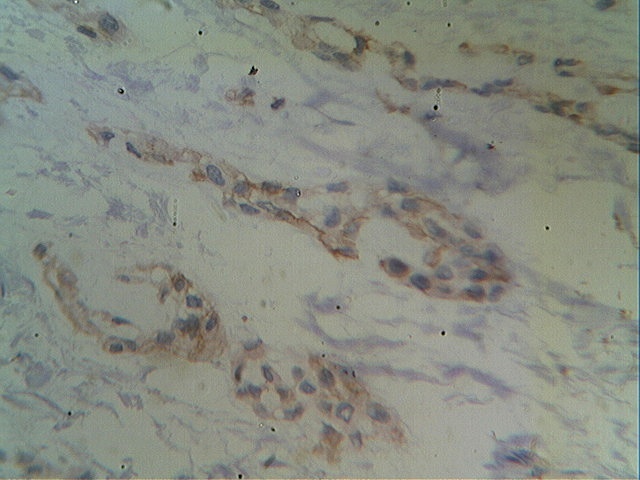 Microscopy revealed cords, nests and clusters of spindled and stellate cells with scanty to moderate amphophilic cytoplasm, uniform dark staining nuclei and indistinct nucleoli. 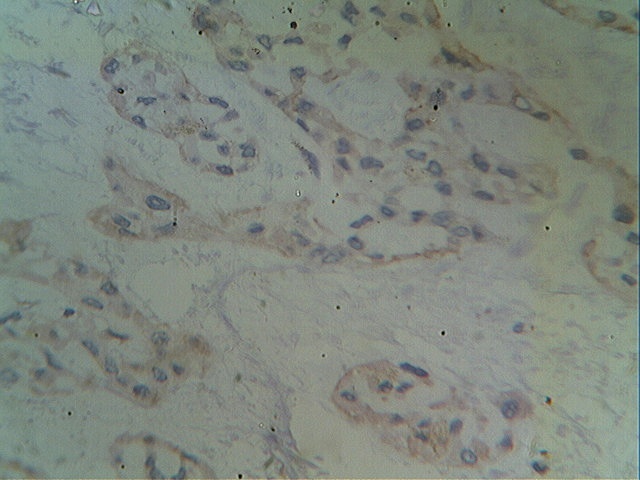 These cells were dispersed within a myxoid stroma, which was positive for Alcian Blue at pH 4.0 and 5.0, suggesting the presence of chondroitin sulfate. 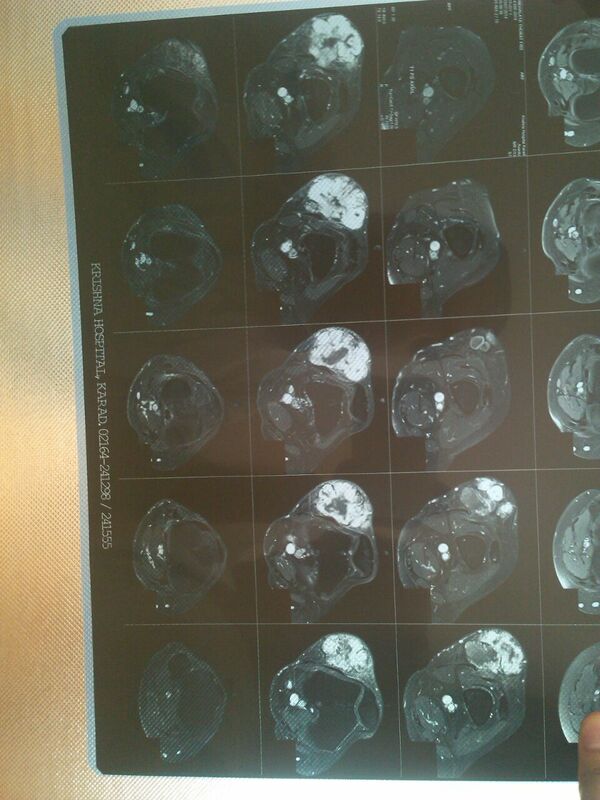 The tumor was immunopositive for CD117 and immunonegative for desmin, EMA, MDM2, S100 protein, SM4, synaptophysin, CD10 and CD68. First described by Stout and Eroer, extraskeletal myxoid chondrosarcoma (EMC) is an uncommon tumor accounting for less than 2% of all soft tissue sarcomas (Skeletal Radiol 1999;28:354, Cancer 1953;6:581). The tumor primarily affects adult males in the fifth decade (Pathol Int 2005;55:453) and occurs in the deep soft tissues, particularly in the lower extremities. 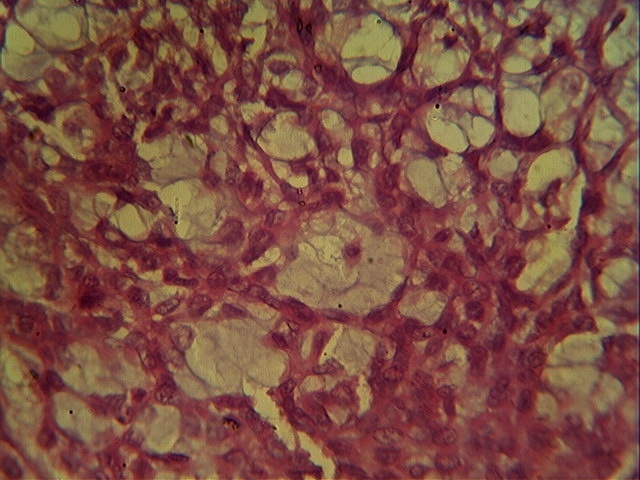 The tumor usually presents as a painless, slow-growing soft tissue mass, although in rare cases it may present with lung metastasis (Folpe: Bone and Soft Tissue Pathology, 2009). 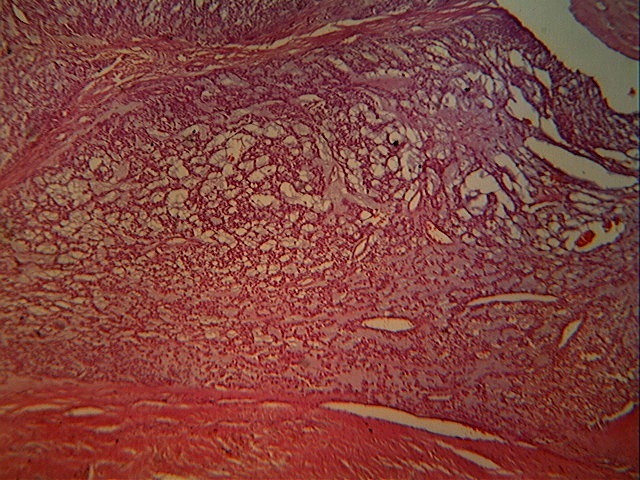 On gross examination, EMC appears as a lobulated soft tissue mass, > 5 cm, with gray and gelatinous areas. Microscopy reveals cords, nests and clusters of spindle cells dispersed in a gelatinous matrix. 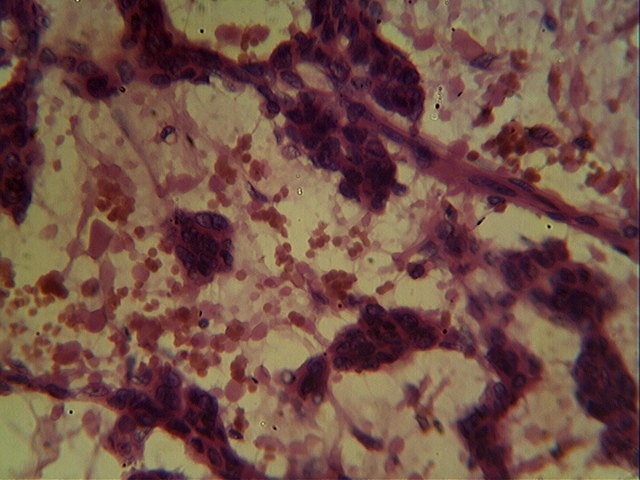 Cellular and matrix -poor tumors reveal nuclear atypia with frequent mitosis (Folpe: Bone and Soft Tissue Pathology, 2009). 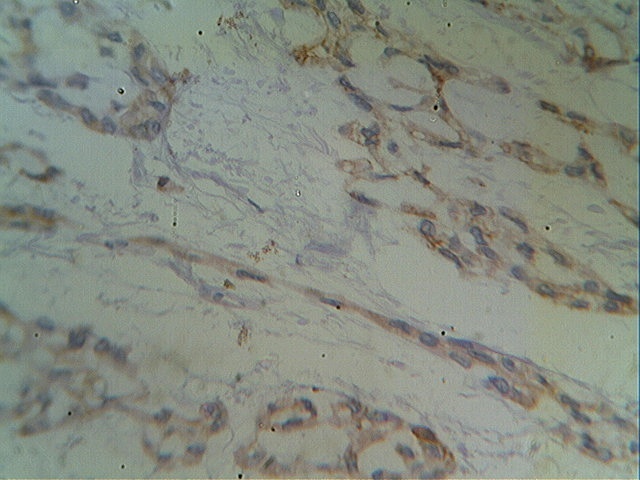 The tumor is immunoreactive for neuron specific enolase, S100, synaptophysin, vimentin and CD117 (APMIS 2009;117:518, Am J Clin Pathol 2002;117:188). Chromosomal rearrangements involving 9q22, such as t(9;22)(q22;q12), and resultant NR4A3 fusion genes are pathognomonic for this entity. 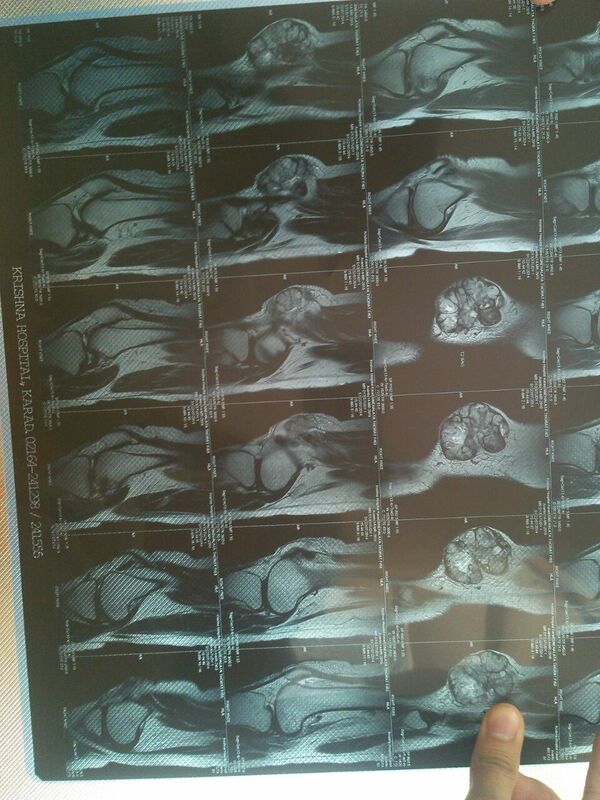 Radiologic findings are often non-specific (Orthopedics 2009;32:919). 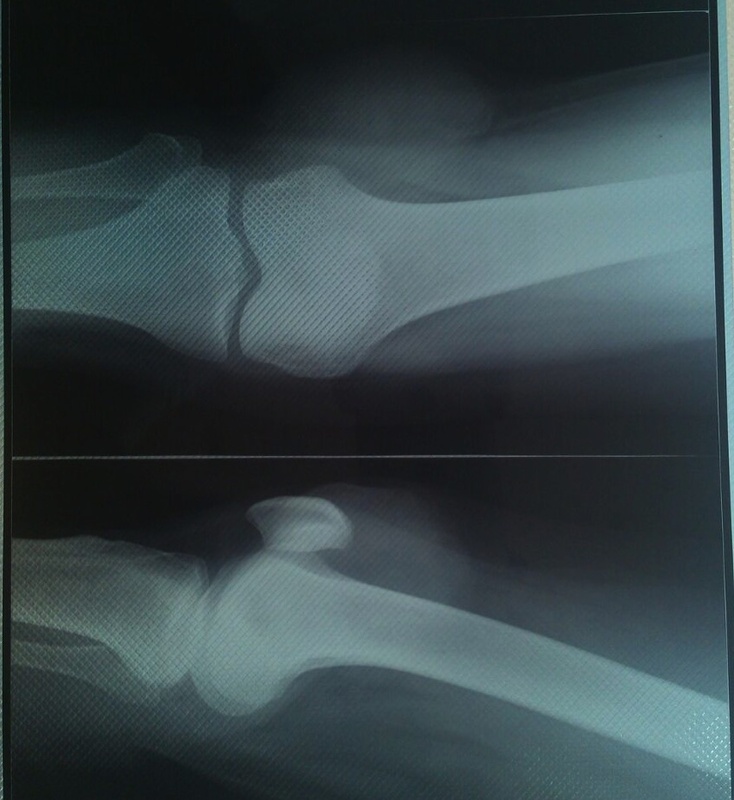 The differential diagnosis includes soft tissue chondroma, soft tissue osteosarcoma, osseous chondrosarcoma with soft tissue extension and ossifying fibromyxoid tumor (Folpe: Bone and Soft Tissue Pathology, 2009). 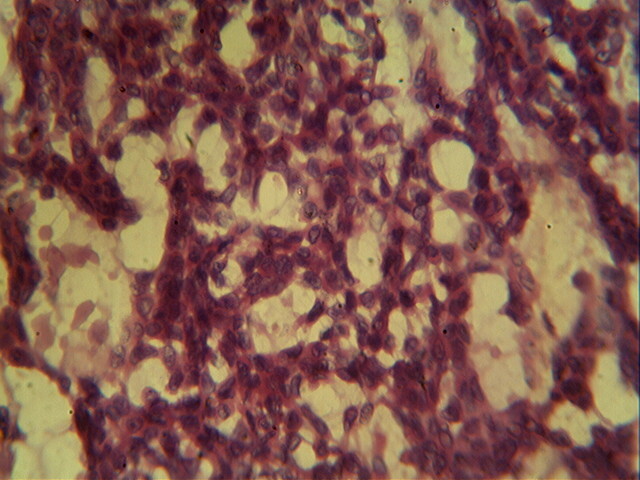 EMC is distinct from osseous chondrosarcoma on the basis of clinical presentation, histology, immunohistochemistry and cytogenetics, as well as prognosis. 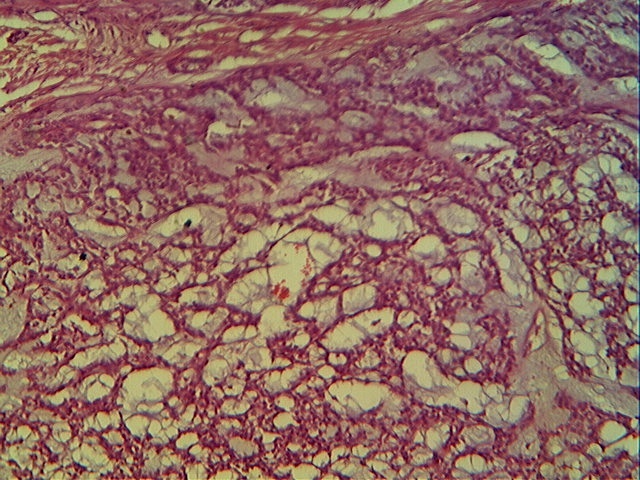 Unlike most chondrosarcomas of the bone, mature chondromatous tissue is a rare feature in EMC (Cancer 1953;6:581). EMC has a high overall recurrence rate with 5-year survival of 65-80% (Folpe: Bone and Soft Tissue Pathology, 2009, J Bone Joint Surg Am 1980;62:189). Histological grading does not correlate with prognosis. Increasing patient age, larger tumor size and tumor location in the limb girdle or proximal extremity are adverse prognostic factors. Treatment consists of wide surgical excision, and chemotherapy and radiotherapy can provide palliative benefits to patients with widespread metastases (J Bone Joint Surg Am 1980;62:189). Close, long-term clinical follow up is essential due to the protracted clinical course and high rate of recurrence (Am J Surg Pathol 1999;23:636). 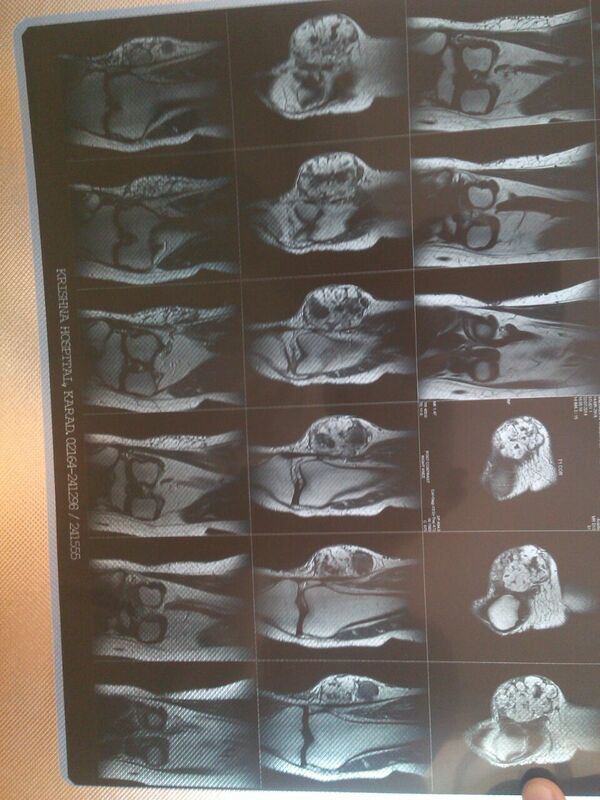 In this case, at three months follow up, there was no recurrence.